Lynn Marie Houston holds a Ph.D. from Arizona State and an MFA from Southern Connecticut State University. 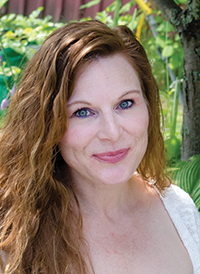 She is the editor-in-chief of Five Oaks Press and also the author of The Clever Dream of Man (Aldrich Press), which won 1st place in the 2016 Connecticut Press Club book awards and 2nd place in the 2016 National Federation of Press Women’s literary competition. Her forthcoming chapbook, Unguarded, won The Heartland Review Press inaugural book contest. This collection, The Mauled Keeper, was a runner-up for the 2016 Cathy Smith Bowers competition. Tim stores a shotgun under his desk, next to the fancy stationary. for the wealthy patrons. But if an animal escapes, he’s trained to kill. I am watching, and then aims for a squirrel. A tuft of fur goes flying. The animal, still alive, scatters off with a bald spot on its tail. Tim sits, swigs his beer with a smile, and gives me a quiz. 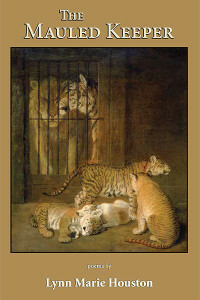 animal is about to escape the zoo, which one should he shoot first? The tiger mauling the keeper, I guess. He shakes his head. You have to think of loss in terms of numbers. The animal about to escape, because it could kill more people? Exactly, Tim says, and readies the gun again. I’m not supposed to save the one, he says. I’m supposed to save the many. the sacrifice romantic love entails: to reject all others and cling to only one. In the echo of his gunshot, I hear the latch of a cage door open. Something wild from my chest runs free across the yard. in the stark sky between sun and baked earth. when I should have played dead. that can save you when it counts. by a camper’s careless fire. after I have put away my camera. than I would be to try again.